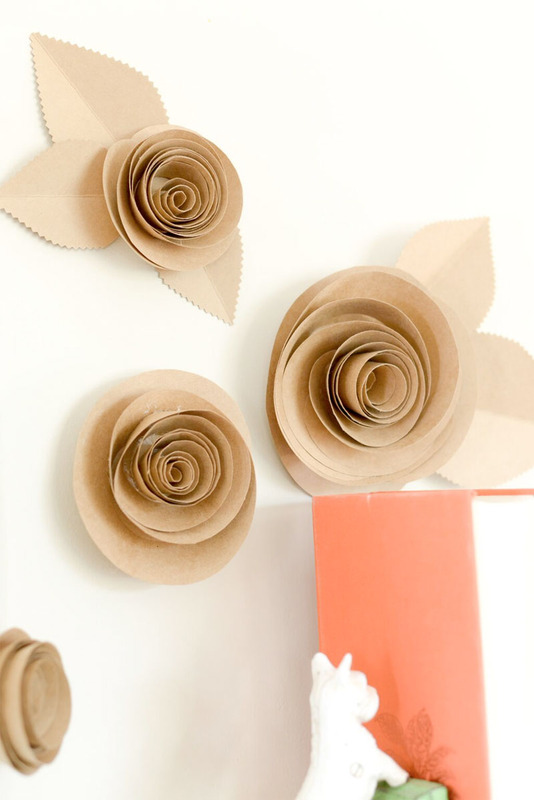 Create a themed home décor set or embellish your cards and pages with some kraft-colored rolled flowers. Using the template cut desired amount of rose shapes. Starting with the first piece, tightly roll the flower like a cinnamon roll, beginning at the outer edge of the spiral and rolling in to the center. Release and allow the spiral to uncoil a little until desired look is achieved. Hot glue the rolled spiral to the center base underneath the spiral. Hold it in place until it has cooled. Using the template cut desired amount of leaf shapes. Score and fold each one in the center. Attach leaves to the back of the flower. Display and/or attach them where desired. Flowers can go on the wall, in a bridesmaid bouquet, on top of a gift, on a banner, and more! Depending on where the flowers will be used, add the leaves or leave them off. Don’t stop at just kraft colored flowers—look for the other fabulous prints and solids from DCWV to make a grouping of flowers with.